"The young LUIGI TORCHI (pronounce torki) was a carpenter who, so far as I can understand, had only been to primery school. 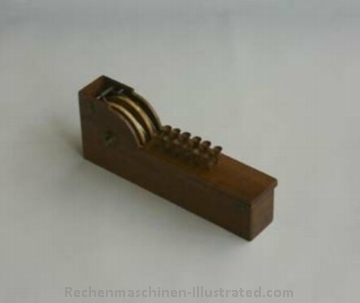 In 1834 he obtained a gold medal for a calculator he had created from pieces of wood and steel wire. It took him three years to build the first machine. No mention of his birth. So far as I can understand, his machine did three operations (sums, subtractions and multiplications). It was particularly adapted for products with a common factor. 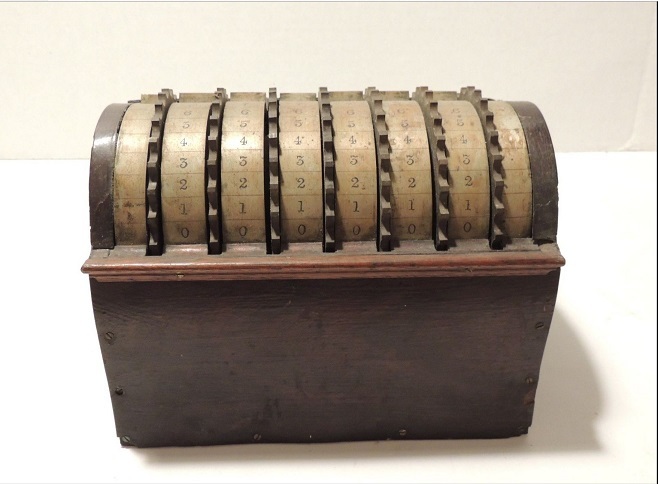 It was built to multiply numbers of 3 digits with 4 digits. The near 66 millions products that could be obtained would have represented at least 44 five-hundred page volumes. Carlino was the first to report the potential advantages of this machines and various scientists tried to convince the vice king to finance its improvement. This is reported in a letter dated 1835 written by Giuseppe Belli and sent to the mathematician Gabrio Piola. 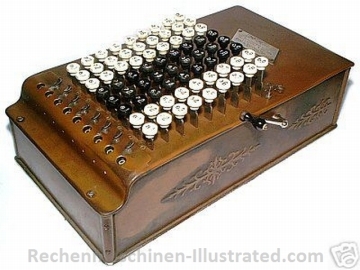 In March 1840 the vice king authorized the purchase of of a metal model of the Torchi machine capable of products of three per four digits for a price of 1 000 Lire." "A Jew S(elig) Slonimski born in Bialystok, recently invented a small machine for calculating, which thanks to its dimensions (length 10 inches,width 3 inches and 1 inch height), comfort, and low price deserves to be widely used. Everybody who knows digits only can, with the help of this machine, make calculations easily, fast, and without need to think. 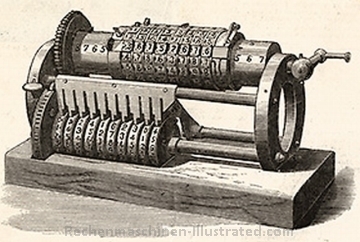 This machine can be seen at the inventor’s residence, where he is now working on a new machine for calculating logarithms. 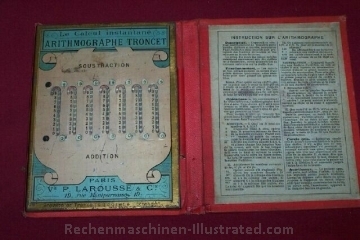 With the help of this machine one can simply and comfortably find the differences of Bruget logarithms,as well as natural logarithms up to 14 decimal digits"
Chayyim Slonimski also designed a multiplication device for which he received a prestigeus Demidov Prize in 1845. 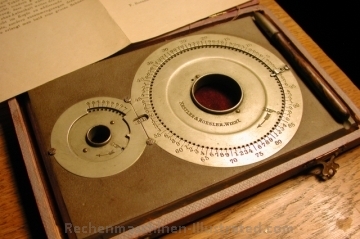 This was a non-mechanical device allowing to view multiplication results for all multiplicands (2-9) without mentally adding carry. 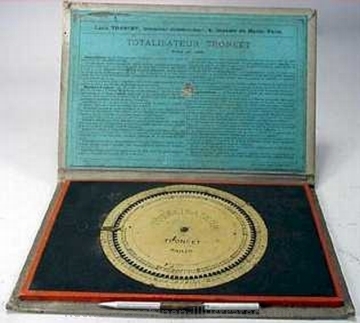 The device was based on the mathematical theorem invented by him. principle State machine. For each column (decimal position) an index related to the current state of carryovers and multiplicand value points to the results in the next column and the state of carryovers for the following columns. In each column results of the multiplication by a multiplier 2-9 are concurrently seen. 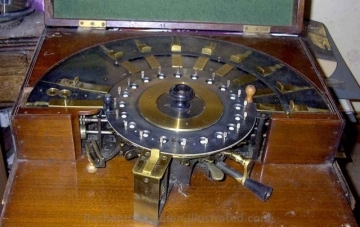 "Dr. Didier Roth, Paris, designed an adding and subtracting machine with a stylus setting mechanism - similar to Pascal’s machine but materially improved." Bericht des Hrn. Theodor Olivier über die Rechenmaschinen des Hrn. Dr. Roth in Paris. Dr. Roth also designed a machine that externally resembles Hahn's machine and possesses gears with a variable number of teeth (pinwheel). "No details are known about this machine that was patented in England." 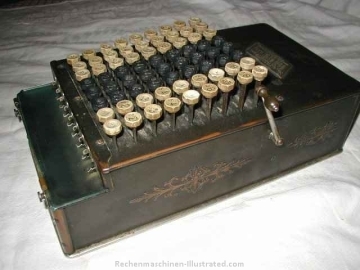 This is a seven-place adding machine made by I. A. Staffel, a Pole. The machine is the property of the Muzeum Techniki, Warsaw Poland. 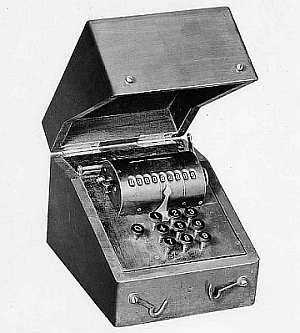 Staffel also constructed a full 4-specie (plus square-root) calculating machine, not mentioned by Martin. 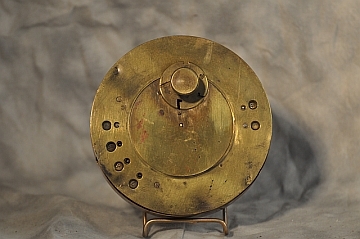 "This device was made by Maurel and Jayet. The machine is especially well suited for multiplication and division but is also capable of performing additions and subtractions. The operation is very simple. The whole setting mechanism and the result windows are shown in figure 31." According to NMAH (a part of Smithsonian Institution) website Samuel S. Young of Eaton, Ohio, took out three patents for computing devices. 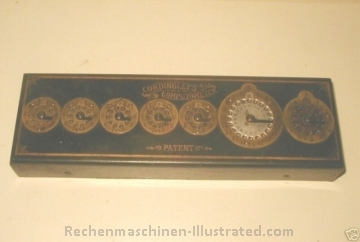 The first one was adding device patented July 24, 1849. 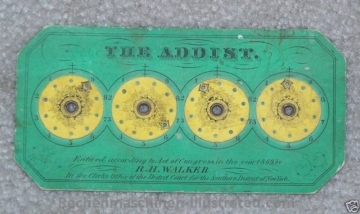 The later ones were a rule for calculating interest, patented September 2, 1851 (U.S. patent 8323), and an arithmetical proof rule, patented October 26, 1858 (U.S. patent 21921). 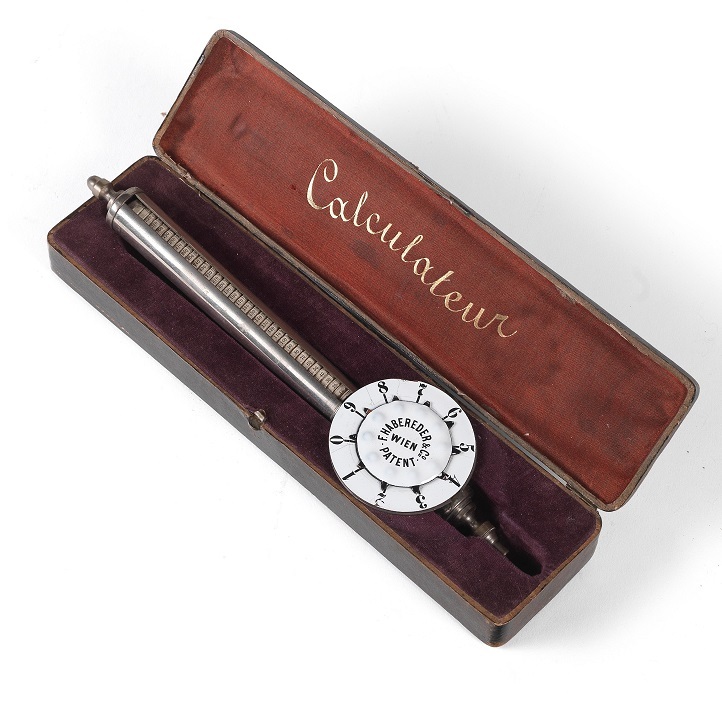 The one below is an interest calculating device. 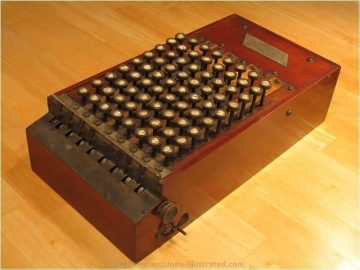 Young's devices in "History of Computers and Computing, Calculating Tools, ....."
On September 26, 1854, a certain Aaron L. Hatfield of Lewisburg, Pennsylvania, took out a US patent no 11726 for machine for adding numbers. 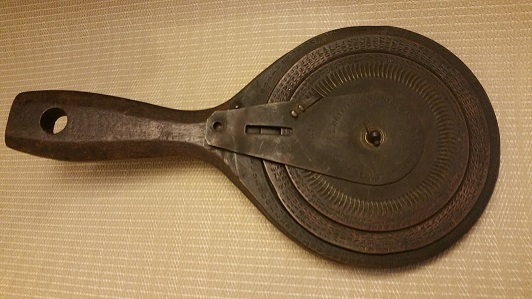 There is another calculating device from the time, made by another Hatfield, Jehu, from Glens Falls, New York, patented as Machine for calculating interest in 1844 (patent no 3574), but it seems there is no relation between them. 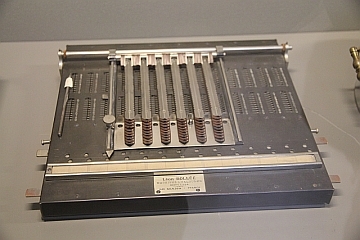 Aaron Hatfield's adder in "History of Computers and Computing, Calculating Tools, ....."
From Giorgi Dalakov: Appleby was born in 1807, all his life lived in Shaftesbury, Devonshire, unmarried, working as Linsey Maker/Hosier and parish clerk, died probably in 1891. 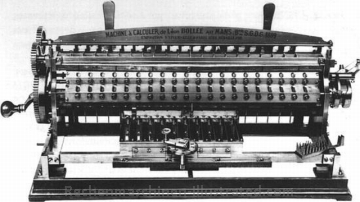 "Hill’s machine, as illustrated in figure 33, shows considerably more similarity with our modern keyboard adding machines than either Parmelee’s or Schilt’s device, yet it never advanced beyond the experimental stage. The model illustrated may be found in the National Museum in Washington. The individual digit wheels have the digits 0 to 9 inscribed around them seven times. 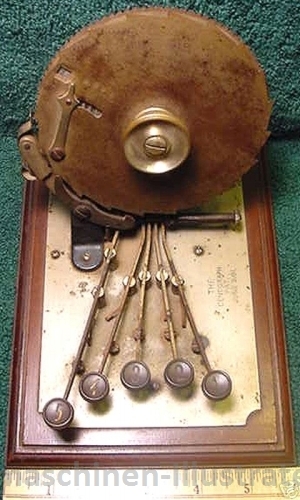 These digit wheels are moved by a gear which, in turn, is driven around by the action of depressing a key on the keyboard. There are no overthrow locks. 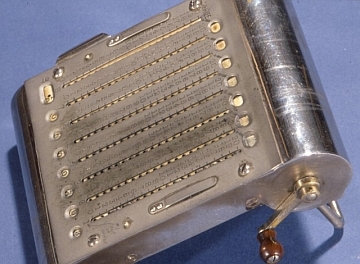 The tens-carry mechanism is similar to that of Pascal’s machine." 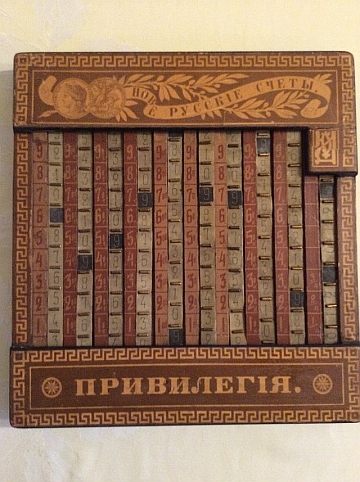 Herschell Filipowski's Calculating Machine for Multiplication and Division, composed of a total of fifty-six wooden calculating rods, each rod with printed paper alphabet letter to crown and printed paper cover with ten columns of figures (each with nine rows). Manufactured by the Fowler Adding Machine Company, New York. Patented by George B. Fowler July 14, 1863. 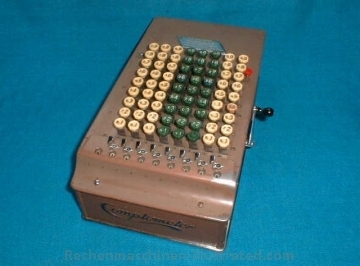 Also marketed under the name "The Universal Adding Machine". 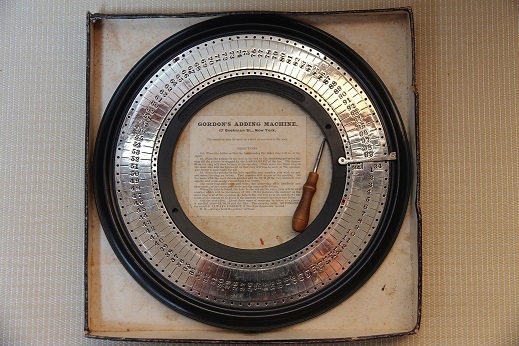 "Designed by C. H. Webb, it consists of two rotable circular disks, one for the numbers up to a hundred, the other one for thousands. The apparatus has automatic tens-carry." The Webb Adder in "American Artifacts"
Webb's Adder and Ribbon Adder in "History of Computers and Computing, Calculating Tools, ....."
production years 1868 - ???? it is not clear if Nestler & Roesler was a distributor for Webb or if they produced the adder with or without license. 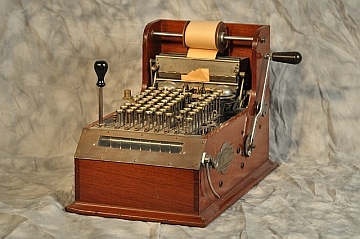 "This is a small adding machine along the lines of Dr. Roth’s machines (figure 30). It has six places in both adding and subtracting viewing windows. During the seventies, the machine was manufactured by Ziegler and McCudry and distributed in Philadelphia. However, it was never widely sold and production has long since ceased." 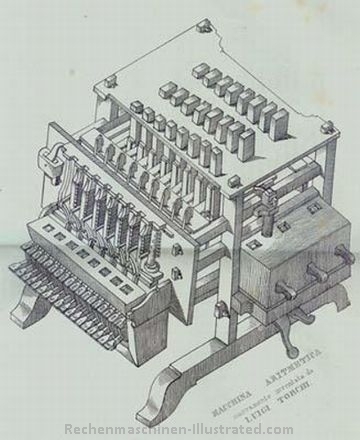 "A nine key machine for adding single columns of numbers. The machine never went beyond the experimental stage." 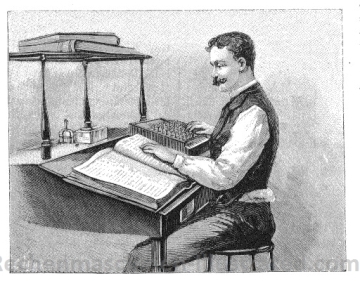 Chapin's devices in "History of Computers and Computing, Calculating Tools, ....."
"Frank Stephen Baldwin was born on 10 April 1838 in New Hartford. 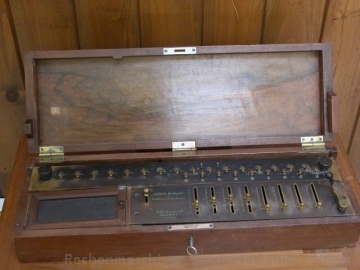 About 1870 he saw the first stepped drum machine and it caught his interest. He decided to build a machine with only one cylinder instead of nine drums. A patent application received at the patent office in Washington on 5 October 1872, which contains exact details and drawings of Baldwin’s machine, specifically of the model that appeared on the market in 1875 that included the gear with the variable number of teeth. Under the date of 8 September 1873, an improvement on the first model was added to the patent." 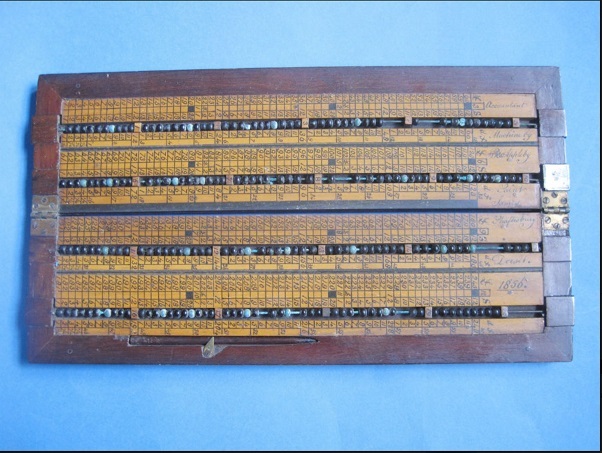 "Since Odhner’s efforts date back only to 1874, the year he made his first model, it seems now definitely proved that Baldwin was the first to employ, in practice, the gear with the variable number of teeth in a calculating machine. 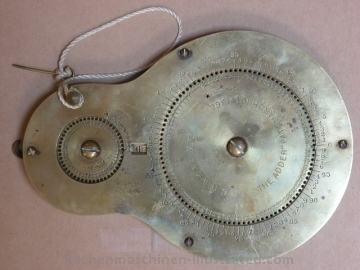 It may be assumed that Odhner reinvented this device at a later date. In any case we have no proof whatsoever that Odhner imitated the Baldwin machine, which, as is widely known, the Americans often claim." "This machine was constructed by George B. Grant as early as 1870, but was not publicized until 1877. Additional publications concerning this machine are likely to appear in Brooklyn in the near future. An upper cylinder is turned by means of a crank and drives a small shaft mounted underneath. 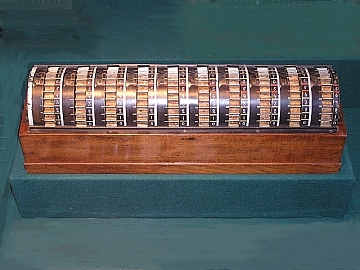 A slide on the cylinder, which may be set in eight different positions, carries eight digit rings that may be set for eight or fewer decimal places. With each turn of the crank, the numbers set up in the rings are added to the value set in the ten numeral wheels of the lower shaft." "The machine illustrated in figure 51 also originates from the same inventor. 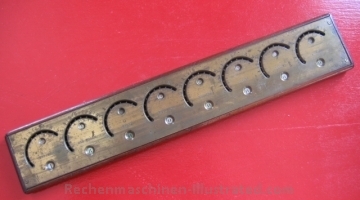 In front there arc five setting slots with setting levers protruding from them; each slot has two rows of additive and subtractive setting numbers printed adjacent to it. Movement of the setting lever forward or backward moves the racks visible in the drawing. When the crank is turned, the whole carriage is moved forward, and the setting racks mesh with the gears and move them, together with the appropriate numeral wheels. When the carriage is returned, the connection between racks and gears is broken and a successive tens-carry takes place. Zero setting also occurs by rotation of the crank. " 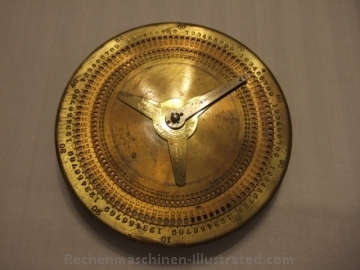 "In I876 C. Dietzschold, an engineer in the town of Glashütte, set out to build a multiplication machine. He encountered difficulties, however, and asked for help from one of his schoolmates, Arthur Burkhardt, another engineer who was then serving his time in the army. 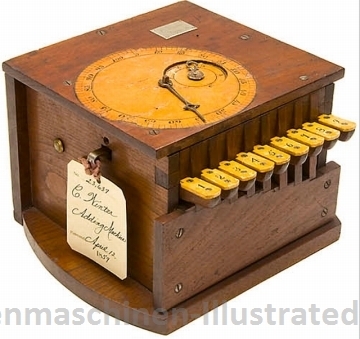 Burkhardt came to Glashütte in 1878, shortly after Dietzschold had supplied one of his machines to the Royal Prussian Statistical Office. The statistical office found that the machine did not operate to their full satisfaction. 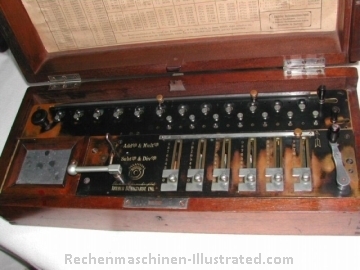 A year later Burkhardt replaced this machine with two others constructed according to the stepped drum system (Thomas-Colmar) and thus laid the foundation for the calculating machine industry in Germany. 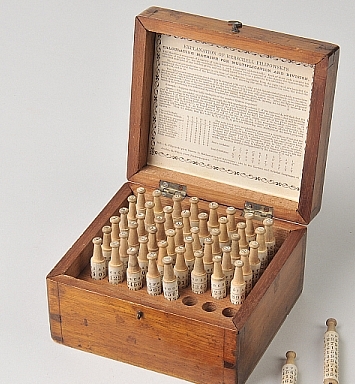 Soon afterward Professor Dr. Reuleaux confirmed that Burkhardt's product excelled the French one in many ways. 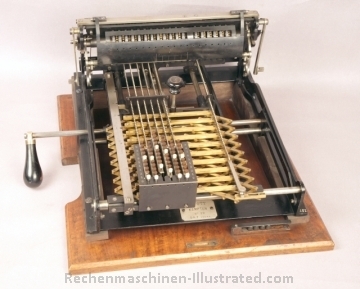 A number of machines were produced for government authorities, insurance companies, and the like, but the demand for such machines was still so insignificant that Burkhardt had to turn to the manufacture of other articles and, in fact, had to leave Glashütte for Braunschweig (during which time he was active in an entirely different line). 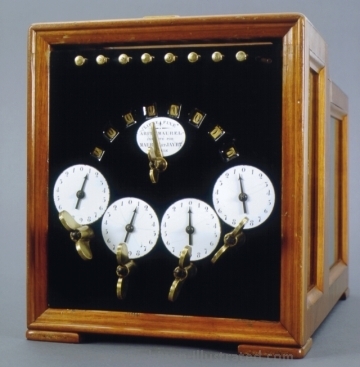 He later returned to Glashütte and again devoted his time to the manufacture of calculating machines, which were becoming popular in commercial firms, manufacturing enterprises, and banks. 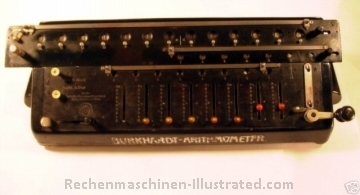 Burkhardt is generally regarded as the founder of the calculating machine industry in Germany, and in the course of years he managed to keep improving his product so that, even today, it is still very popular and meets with increasing sales. 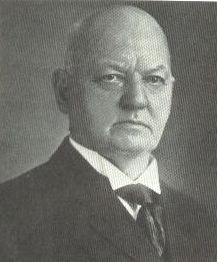 Burkhardt died on 21 July 1918. 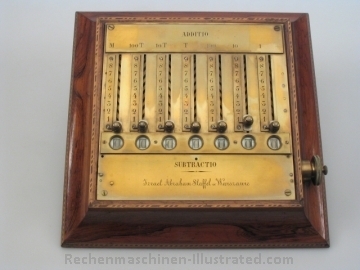 The "Erste Glashütter Rechenmaschinenfabrik von Arthur Burkhardt in Glashütte" merged, in 1920, with the Glashütter Rechenmaschinenfabrik, Saxonia, also in Glashütte, so that nowadays the Saxonia machine is manufactured by the same firm. The name of the new firm is Vereinigte Glashütter Rechenmaschinenfabriken, Tachometer- und feinmechanische Werkstatt, Glashütte, Sachsen." On Aug. 28, 1929, the company went out of business. 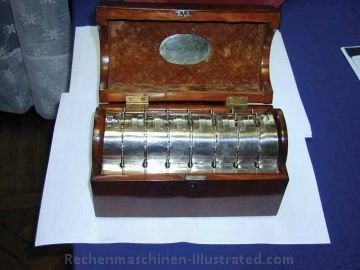 "This is a combined adding, subtracting, multiplying, and dividing machine designed by the Russian mathematician Tschebicheff. Only one example of the machine was built, in Paris, and it may be found in the Conservatoire des Arts et Métiers. The machine does not use any springs." 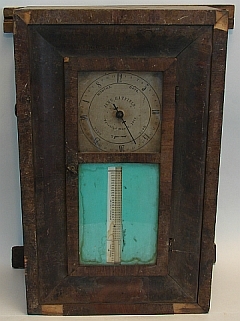 "From 1883 to 1886 Layton’s Arithmometer was manufactured and sold by Charles and Edwin Layton on Farrington Road in London. 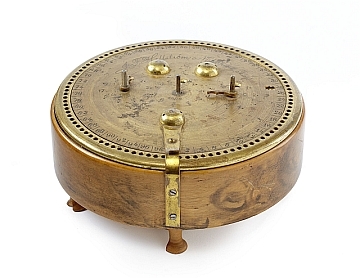 This was the first English stepped drum machine. Later Tate, a sales agent for the machine, improved it. It was sold under the name Tate from 1907 until 1914. " 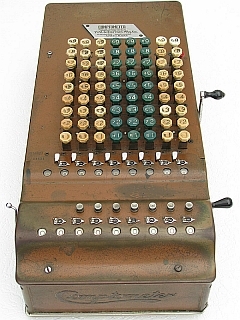 "This is a single-column adding machine with nine slides, situated in one row, for setting up the individual digits. 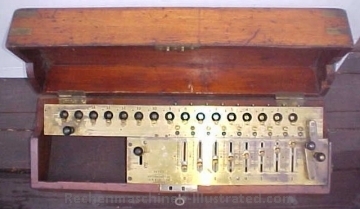 Instead of the customary counting gears, this machine has mounted on its surface two numeral dials, each with a pointer. 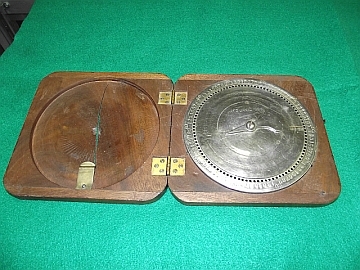 The large dial on the left (figure 62) is for the numbers 1 to 99; the hundred is automatically transferred to the smaller dial o n the right. The machine was never put into production and remained unknown in practice." 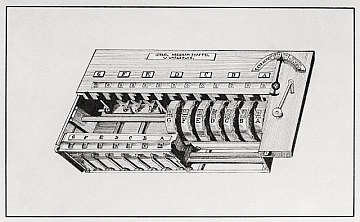 "In this machine the multiplicand and divisor are set with the aid of the slides shown in figure 63. The result mechanism and revolution counter are situated upon a circular disc in the center. This arrangement has the advantage that a division that does not end without remainder may be continued for any selected number of places, whereas the stepped drum machine or the pinwheel machine only permit division to be carried on over a limited number of places. The machine is provided with a zero-setting device with which some, or all of the windows may be set to zero. The machine was manufactured by Blakey, Emmot. and Company in Halifax." "Dorr E. Felt was employed as a mechanic in Chicago in 1884 when he was twenty-two years old. 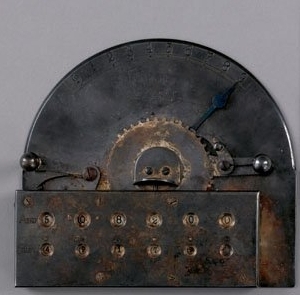 He spent his free time on experiments making a calculating machine. In 1885 his first machine, which admittedly was rather primitive, was completed. It is illustrated in figure 64, and since it was built into an old macaroni box. it received the name macaroni box model. This model is still in existence today. In November 1887 the firm Felt and Tarrant was founded. 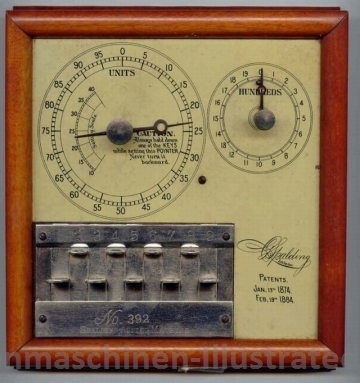 It was registered in January 1889. and since that time the firm has been manufacturing Comptometer calculating machines under the personal management of the inventor." 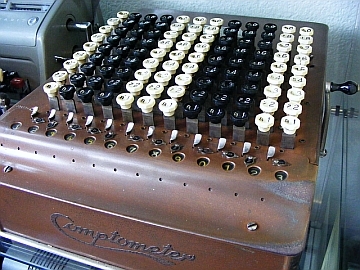 Jay M. Goldman has a very nice collection of Comptometer on his web page. Brooke W. Boering maintains the Comptometer home page. Here you find everything you want to know about the Comptometer. known s/n 100,000 - ? "Professor Dr. E. Selling of Würzburg designed a calculating machine in which the tiresome turning of the crank, and also the jerky tens-carry, was successfully avoided by employment of the device known as the Nuremberg shears (also known as a stork bill). I . The Nuremberg shears with toothed racks and keyboard for setting the multiplicand. 2 . The gears and numeral wheels. all mounted upon a common shaft and adapted to receive the longitudinal movement of the racks and convert it into a rotating movement. The numeral wheels are connected with one another by so-called planetary gears for the purpose of tens-carry. Thus a malfunction due to spring obstructions is rendered impossible. The actual calculating occurs by opening and closing the Nuremberg shears by means of a hand ring, the magnitude of such movement being determined by the multiplier." "Designer: Otto Büttner, Kaulbachstr. 18, Dresden, Sales agency: Wilhelm Brückner, Dresden. In appearance the machine resembles the contemporary stepped drum machines." this is a pin wheel machine. "All calculating machines described so far have implemented multiplication by continued addition and division by continued subtraction. 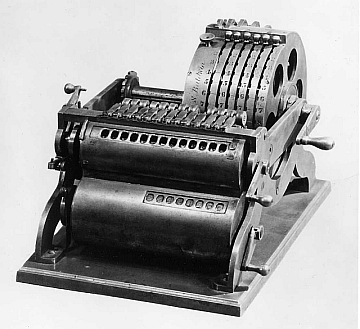 Leon Bollée, born 1 April 1870, constructed in the course of three months (from February until April 1888) a calculating machine in which the multiplication table was mechanically represented for the first time. In other words, he created the multiplication body that we find today in the Millionaire machine, in the Moon-Hopkins machine, and in the Kuhrt machine, although the various manufacturers designed it in slightly different forms." This instrument combines slide adder mechanically connected with a series of overlapping multiplication rods. 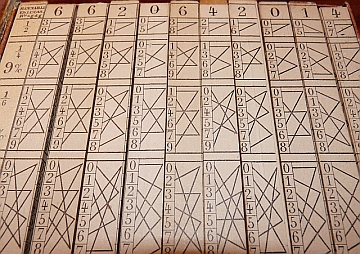 Partial results (of multiplication) are not given in form of digits, like on Napier’s bones, but by the positions of adding wings (coulisses d’addition). 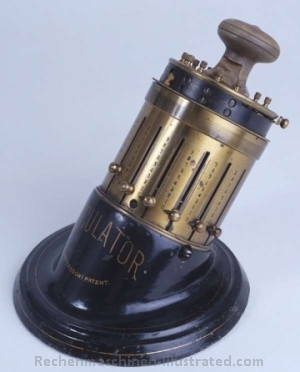 small adder, constructed by Arthur E. Shattuck, San Francisco; patented June 9, 1891. 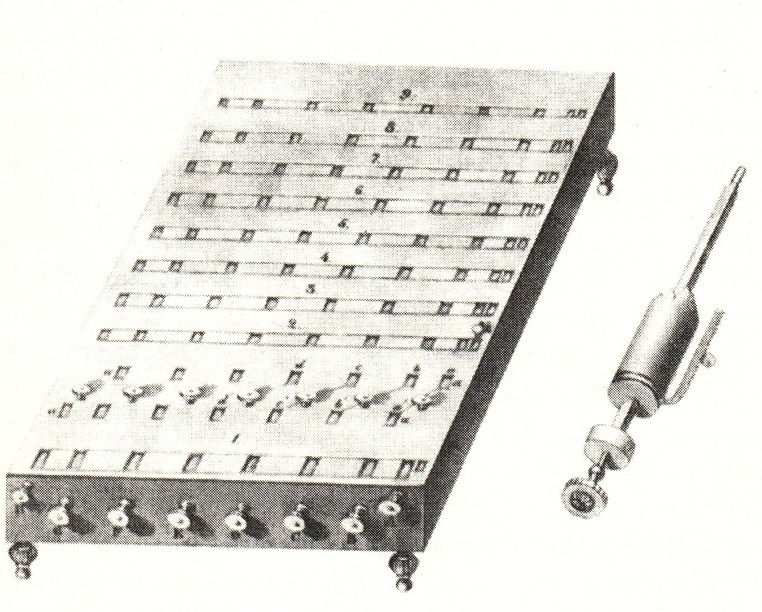 "grandfather" of the Rapid Computer and Comptator. © 2003-2011 Herbert Schneemann and Walter Szrek. All the pictures, articles and any other material are the copyright of the mentioned source. Please do not copy or reprint without a written permission.